Netanyahu speaks with Australian, Indian and British counterparts, discusses material on Iran he revealed this week. Prime Minister Binyamin Netanyahu on Friday spoke by telephone with Australian Prime Minister Malcolm Turnbull, Indian Prime Minister Narendra Modi and British Prime Minister Theresa May. Netanyahu discussed regional issues with the world leaders and also updated them on the important material that he revealed regarding the Iranian nuclear archive. 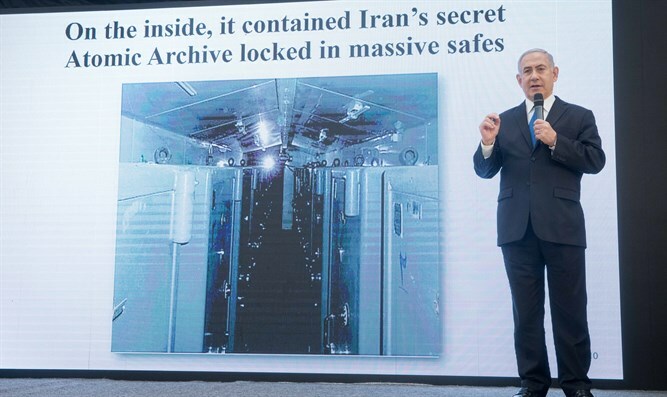 In a dramatic televised address earlier this week, Netanyahu revealed to the public information gathered from Iran’s nuclear weapons program, proving that the Tehran regime had lied about its efforts to acquire atomic weapons. The address came less than two weeks before the May 12 deadline imposed by U.S. President Donald Trump to reimpose sanctions on Iran if no agreement is reached to supplement the existing deal. Trump praised Netanyahu’s speech, saying it "sends the right message" on Iran's nuclear program, but refused to say whether he would withdraw from the nuclear deal. Current Secretary of State Mike Pompeo said the intelligence trove was authentic and acknowledged that much of it was new to American experts. Federica Mogherini, the European Union’s High Representative of for Foreign Affairs and Security Policy, responded to Netanyahu’s presentation on Iran, asserting that he did not question Iran’s compliance with the agreement.